On the 5th of December 2006, typhoon Durian hit Bến Tre province in Southern Vietnam. Close to 100 people died, more than 800 moored fishing boats sank, thousands of buildings collapsed including schools and hospitals. In her master’s thesis, Uy Ngoc Bui looks at how this event changed peoples’ lives and explains why we need more disaster anthropology. They showed great courage, endurance and solidarity by overcoming this challenge. As such, it is perhaps no surprise that my study concurs with the many previous studies which state that disaster management is very dependent on the participation of the community, and their strengths and efforts can determine the outcome of the disaster. In disasters as floods and tsunamis, traditional knowledge acts as warning signs which can be read ahead of time, saving many lives. This type of information should be spread wherever it is useful, as Red Cross has done in Vietnam. I believe that thorough research into traditional knowledge and local coping mechanisms should be emphasised as they are a type of accumulative knowledge which has been passed on throughout generations, adapted to their specific environment. This type of knowledge is valuable because it is not written down, and if is lost, it will be lost forever. Here anthropology has an important job to do. My experience is that more research should be done on the bridging of relief aid with long term reconstruction and development. Relief aid has become more efficient and standardised, which is positive, but this is only short term help for people who are in a vulnerable situation. Decreasing their vulnerability and strengthening their capacity to overcome disasters in the future should be the key foci of anthropologists and NGOs. 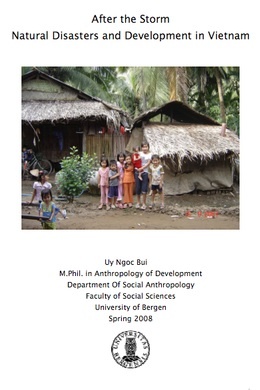 Anthropology provides a unique look at how the local situation relates to the global through the holistic approach. It is therefore important that anthropology uses this approach to better understand the complex local-global linkages in future research. Solid fieldwork on the ground level can show how the lives of the people involved are changed as a result of the disaster and the following intervention by foreign actors. The real effects of natural disasters, the ones that are felt intimately and which linger on long after the dust has settled, are best researched with anthropological methods which can take into account all the historical, economical, political and social factors that are involved in the making of a natural disaster. Many blame the Western industrial ways for corrupting the planet’s eco-system, creating more and more havoc for each year. Research in disaster management therefore also includes research into finding more eco-friendly ways to live. Uy Ngoc Bui has studied anthropology at the University in Bergen, Norway. As she’s “of Vietnamese origin” she felt that she “had an advantage in being half-immersed in the ‘culture’ already, which would make the transition somewhat smoother". Furthermore, people were as interested in hearing about Norway and Norwegian culture as she was interested in them, she writes. The ambition of the project is to study local, social responses to environmental disasters related to water, as spurred by the melting of ice in the Arctic and in other glacier areas, the rising of seas that flood islands and coastal communities, and the drying of lands accelerating desertification in large parts of Africa and elsewhere. The aim is to contribute to a renewed theory of social resilience that builds on the actualities of social life in distinct localities, and pays heed to human agency as the basis for people’s quest for certainty in exposed environments. “Disasters” have been an inter-disciplinary subject for some years. Much of the organization is found in the UK where there is a journal called “Disasters,” which deals with natural and man-made disasters, and “The Journal of Refugee Studies,” which deals mainly with war refugees. There is also a Refugee Studies Programme at Oxford. Anthropological views are occasionally (or even often) presented in this context. There is wide concern expressed in these contexts about the role of international NGOs, and other issues raised in your post. Thanks for this info! I didn’t know of this Disasters journal. I’ve found it here. Looks very interesting. I might blog about it later. sir, your article is thought provoking. i too intend to work on anthropology of disaster, especially focusing upon the community resilience in the flood and cyclone hit coastal Odisha, India. please provide me some valuable dimensions for my PhD. Thank you very much for sharing your ideas. I am also doing my PhD on hazard-induced vulnerability in island villages (char) in Bangladesh. We can think about working jointly in future on disaster or climatic disaster. Cheers.